I had half of a Napa Cabbage left in my fridge and I thought that it will be nice to cook up a delicious dish instead of just using it in soup. Braised Napa Cabbage with Dried Scallops was indeed a thumbs-up dish for our taste buds and tummies, the sweetness of the Napa Cabbage with the umami flavour of the dried scallops goes so well together. If you are not a lover of Napa Cabbage, think twice as it has loads of goodness in them. Weight watchers will be happy to know that it is incredibly low in calories. There are many antioxidant plant compounds, Vitamins C, Vitamin K and loads of other benefits! Nothing beats a home cooked dish that is cooked with loads of love. Try out this easy and simple dish I am sure you will like it. If you like this recipe, be generous and give us some feedback/comments below. We would also like to welcome you to join our Mummy’s Kitchen Facebook Group for food lovers like you, whether newbie or veteran. You can like us on Beyond Norm’s Facebook Page and subscribe to our blog. Follow us on Instagram (@TheRealBeyondNorm) and YouTube (@BeyondNormEats), to get the latest exciting updates and videos. 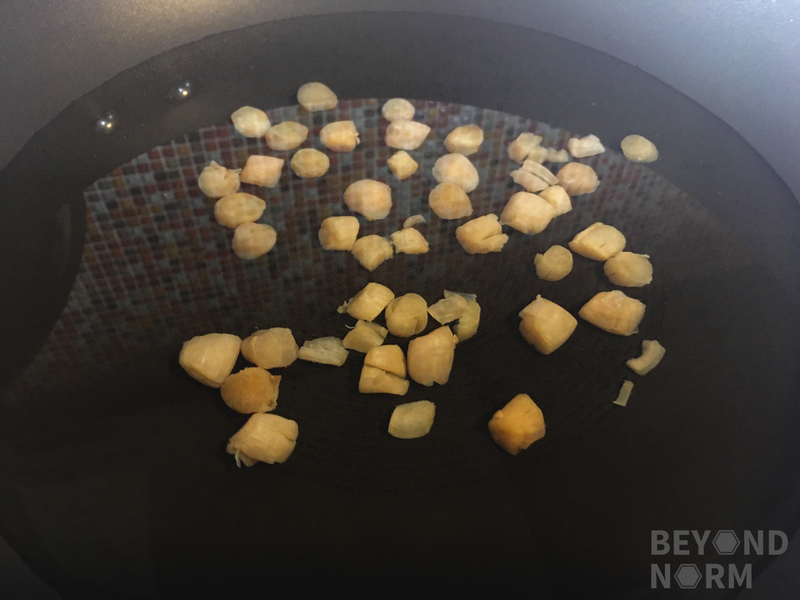 Rinse the dried scallops and place them in a bowl. Add 2 cup water and ½ tablespoon of cooking wine into the bowl and soak with the scallops for 20 minutes. Cut the cabbage leaves down the centre in half first, then stack the 2 halves over each other and cut again in half. 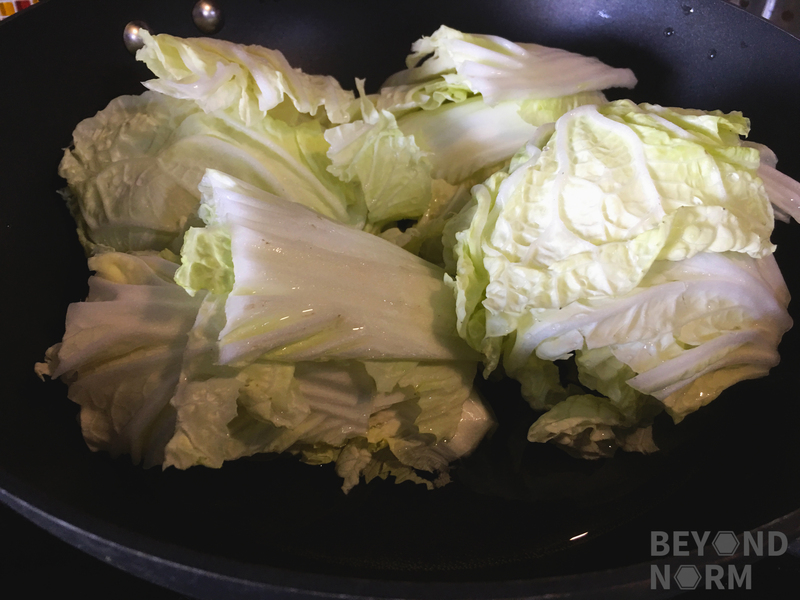 Place the cut cabbage neatly into the frying pan. Next, mix the oyster sauce into the soaked scallops. Pour in the water and the scallops into the frying pan. Bring it to a boil and then lower the heat to braise the cabbage for about 10 to 15 minutes or till cabbage texture is to your liking. Taste and add some salt if needed. Garnish with wolfberries. Then serve immediately. As usual, I did not add in the corn flour mixture. But if you want to, add the mixture in on Step 9.